Celtic striker is called up for U21 games against Denmark and Iceland despite just turning 23. 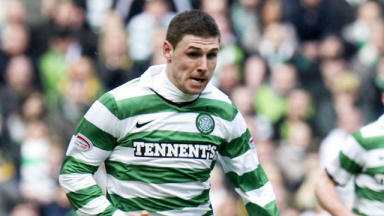 Celtic star Gary Hooper has received a call up to Stuart Pearce’s England Under-21 squad – despite turning 23 last January. The striker – who has netted on 13 occasions this term – benefits from an anomaly of age-group qualification which means he is just on the cusp of eligibility for the U21 championship warm up games against Denmark and Iceland. Hooper will join the likes of Manchester City stopper Micah Richards and Bolton striker Daniel Sturridge in the 31 man squad, which will act as final get together before the UEFA under-21 Euro championships in Denmark this summer. Talking to TheFA.com former England captain Pearce said: “It’s a large squad we will take with us to Denmark, mainly because this is our last chance to take a good look at all of the players who are able to stake a claim for place in the final squad for the summer. “There are one or two fresh faces in there such as Gary Hooper and Mark Davies but in the main the majority of the players are well known to us and have been involved in the qualifying for the tournament. Despite being born in Essex, the former Hereford and Scunthorpe United striker had previously been linked with a switch to the dark blue of Scotland after it was revealed he may have relatives north of the border. However Pearce’s decision to include Hooper in his squad should signify a real interest from the England camp in involving the in-form SPL star.